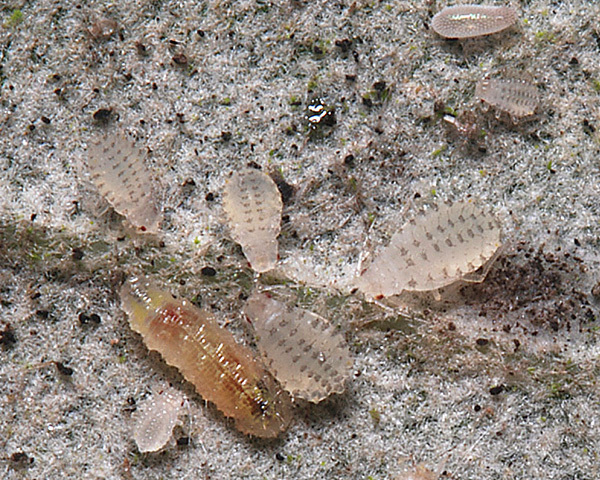 Immature Myzocallis schreiberi (see first picture below) are whitish to pale straw yellow with four longitudinal rows of dark spots and long body hairs. Winged adult viviparae of Myzocallis schreiberi (see second picture below) are pale yellow, with the head and the thorax slightly darker. The prothorax often has short lateral streaks of dark pigment. The dorsal abdomen has small transversely oval, dark spinal spots and paler marginal sclerites. The length of the last segment of the rostrum (RIV+V) is 1.2-1.5 times the length of the second segment of the hind tarsus (HTII) (cf. Myzocallis boerneri in which the length of RIV+V is 0.84-1.25 times the length of HTII). The legs are mainly pale and the siphunculi are usually dark. 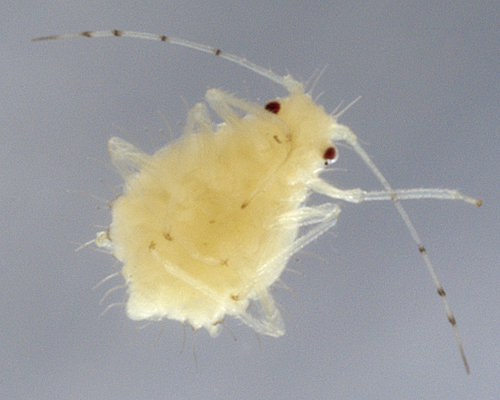 The body length of Myzocallis schreiberi apterae is 1.3-2.2 mm. 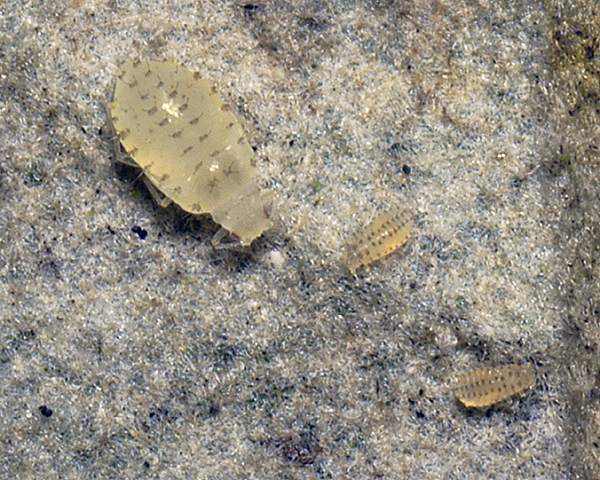 The micrographs below show an immature and an adult alate Myzocallis schreiberi in alcohol. 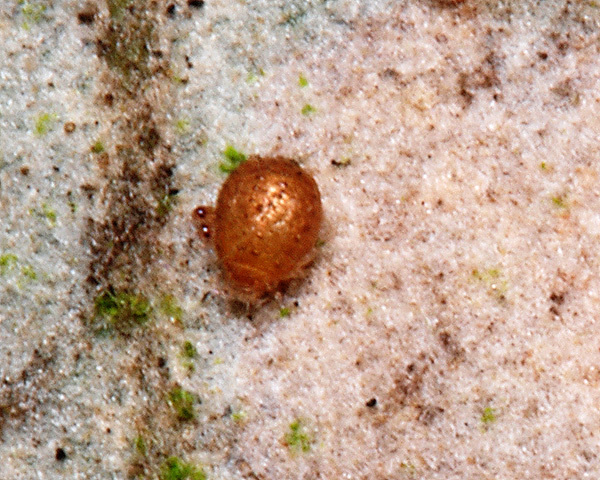 The holm oak aphid lives on the undersides of leaves of holm oak (Quercus ilex) and only rarely on other oaks. Sexual morphs are unknown, and viviparous forms can be found throughout the year. Myzocallis schreiberi is distributed through western and southern Europe. Quercus ilex presents a difficult habitat for aphids as the young shoots and lower surface of the leaves are covered with very smooth trichomes. 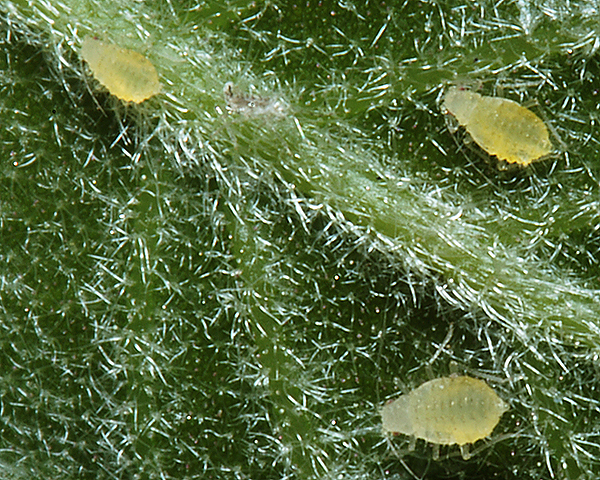 Kennedy (1986) looked at whether mode of attachment to the host may be the basis for specialization in aphids. He found that although Myzocallis schreiberi could walk freely on both its regular host Quercus ilex and on Quercus robur, the related aphid species Tuberculatus annulatus could only move freely on Quercus robur. 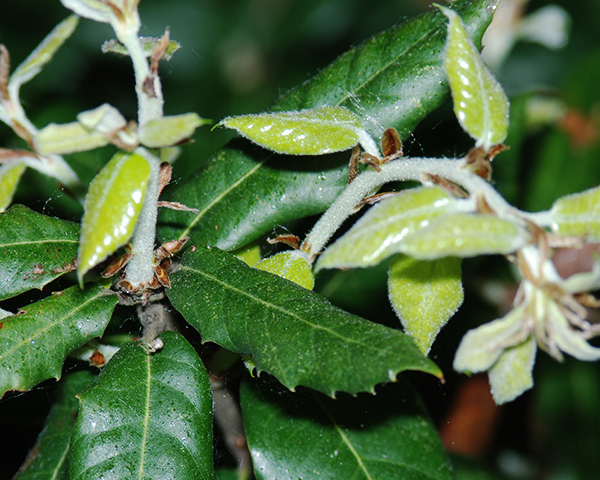 Myzocallis schreiberi achieved attachment to the rough textured leaves of Q. robur by means of pretarsal claws, and to the smooth upper surface of trichomes on the lower surface of Q. ilex using flexible pretarsal empodia. The latter were not possessed by Tuberculatus annulatus. 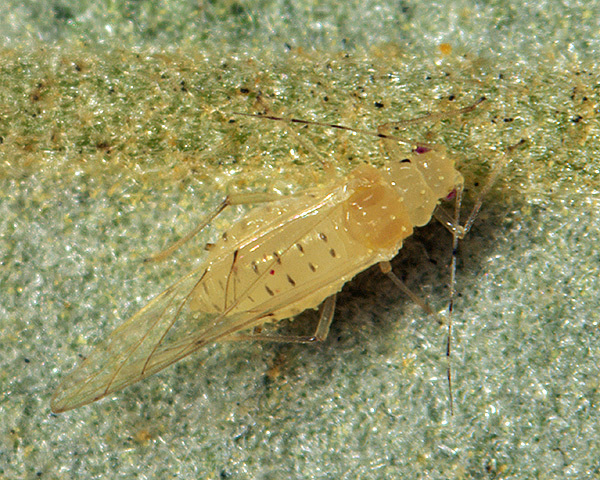 We have observed a number of predators active against Myzocallis schreiberi. Syrphid larvae such as the one below are not uncommon. Coccinellids are also sometimes abundant on the tree feeding on the Myzocallis and Hoplocallis aphids. 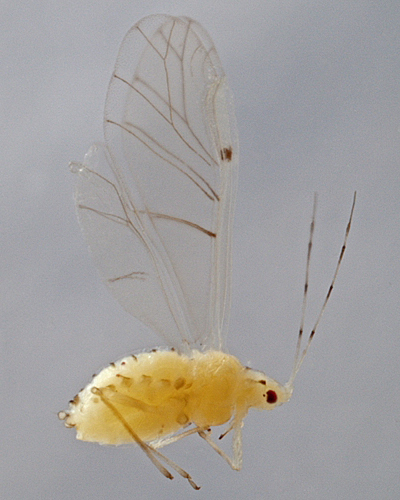 Very few parasitoids have been recorded attacking Myzocallis schreiberi, and we have only found one parasitized mummy of this species (see below). Myzocallis schreiberi has been recorded from 4 Quercus species (Quercus ilex, Quercus ithaburensis, Quercus macrolepis, Quercus pyrenaica - and possibly Quercus suber). Of the 25 species on holm or holly oak (Quercus ilex), Baker (2015) lists 10 as occurring in Britain: Hoplocallis picta, Lachnus longirostris, Lachnus roboris, Myzocallis boerneri, Myzocallis castanicola, Myzocallis schreiberi, Stomaphis quercus, Thelaxes dryophila, Thelaxes suberi and Tuberculatus annulatus.